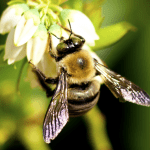 Bumble Bees Removal Long Island | EcoTech Pest Control Inc.
BUMBLE BEES look almost identical to CARPENTER BEES, and the two species are constantly mistaken for each other. There are two distinct ways to differentiate between the two. First, Carpenter Bees have a SHINY BLACK abdomen, whereas BUMBLE BEES are yellow and black with fur THROUGHOUT their body. The second way to differentiate between the two is by their nesting habits. CARPENTER BEES will nest in wood above ground, and will often be seen hovering around a wood structure, protecting their nest while BUMBLE BEES nest in the ground, and will usually be seen hovering around gardens or flowers and then going down close to the ground. Where you see the BUMBLE BEES flying down near the ground is usually an indication of where the entrance into their nest is. The mated queen (fertilized female) will either dig a hole in early spring or find a pile of leaves, wood, debris or old vacant nest. She will tunnel down into the ground, create a brood chamber (egg laying chamber) and begin laying eggs. Their life cycle is similar to that of YELLOW JACKETS. ALTHOUGH NOT HIGHLY AGGRESSIVE, BUMBLE BEES POSSESS A POWERFUL STING AND WILL ATTACK IF THEY FEEL THREATENED. IT IS NOT RECOMMENDED THAT UNTRAINED PERSONS APPROACH A BUMBLE BEE NEST. DUE TO THE NEST BEING UNDERGROUND, CONVENTIONAL CHEMICALS ARE NOT EFFECTIVE IN TREATMENT OF YELLOW JACKETS. A TRAINED ECOTECH PROFESSIONAL CAN ELIMINATE THE BUMBLE BEE COLONY WITHOUT ENDANGERING YOU OR YOUR LOVED ONES, OR EXPOSING YOU AND YOUR FAMILY TO HARMFUL CHEMICALS.